We spent our Sunday afternoon this past weekend helping out our sponsor club, the Rotary Club of Port Moody, with their annual Christmas Tea service at Eagle Ridge Manor. This is always a fun service opportunity to kick off the Christmas season and spread holiday cheer to the wonderful residents at the manor. Check out more photos from this event on Facebook. 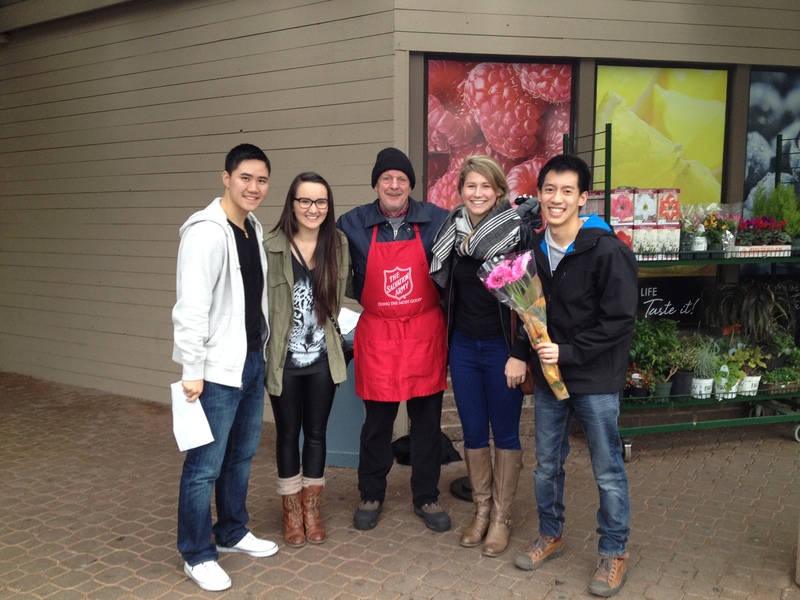 One of the scavenger hunt tasks involved purchasing a hot beverage to warm up a Salvation Army volunteer. 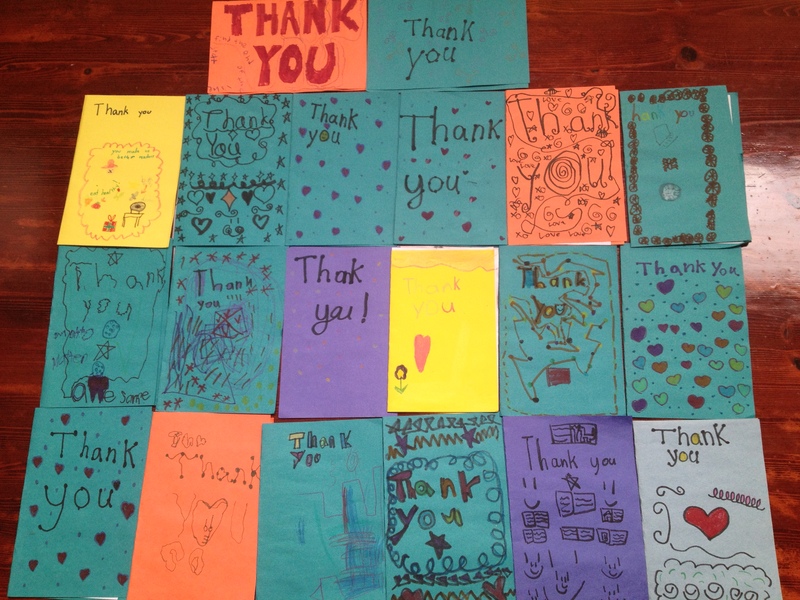 Thank you to Brianne and Rasmeet for organizing the event, and to Kevin, Anabelle, Eric, Raj, Chantal, Adam, Janelle and Jordan for participating! See more photos from the scavenger hunt on our Facebook page. Click for full sized poster. 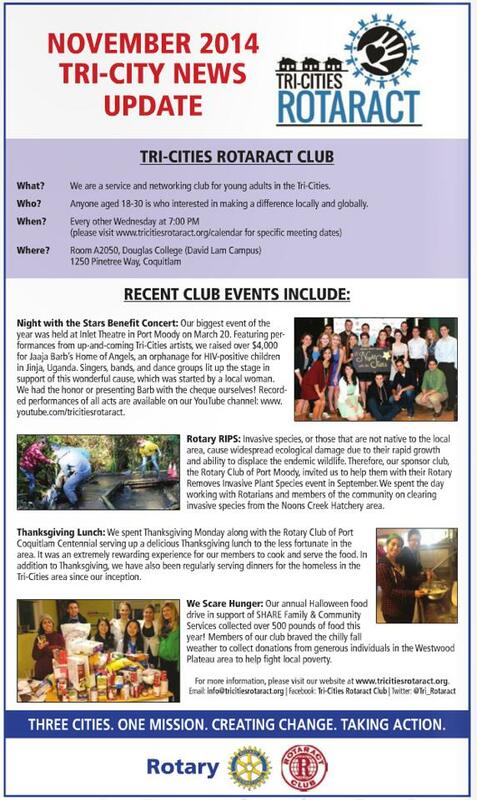 In the spirit of the Holiday season, the Tri-Cities Rotaract is selling tickets for “Unwrapped! 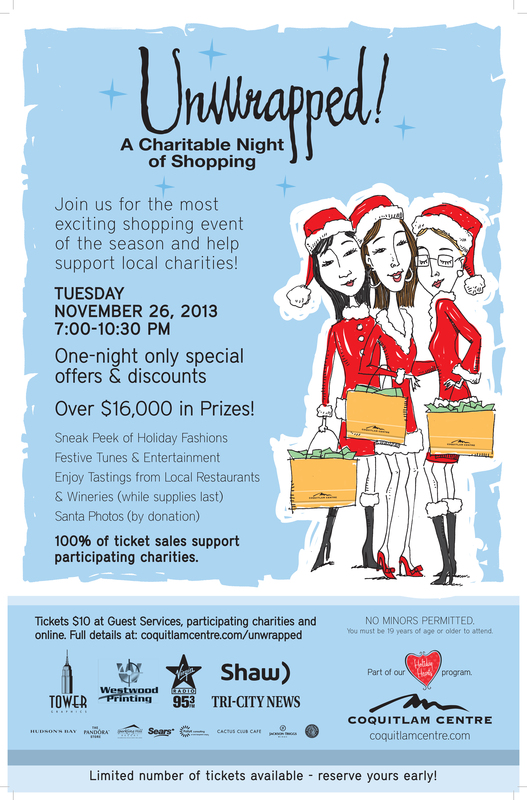 A Charitable Night of Shopping” at Coquitlam Centre Mall on Tuesday, November 26 from 7-10:30PM. With over $16,000 in prizes to be won and lots of special deals and offers, it’s a night you do not want to miss! Tickets are available for $10 from any Rotaract member or by emailing info@tricitiesrotaract.org. All proceeds from our ticket sales will go towards two of our upcoming projects: creating a Christmas hamper for a family in need, and a gift to the seniors at Hawthorne Manor. Alex, Janelle and Jordyn at Zone Bowling. This year, Jordyn from our club took the time to organize a group of volunteers to help out with the BC Special Olympics 10-pin bowling event at Zone Bowling in Coquitlam. 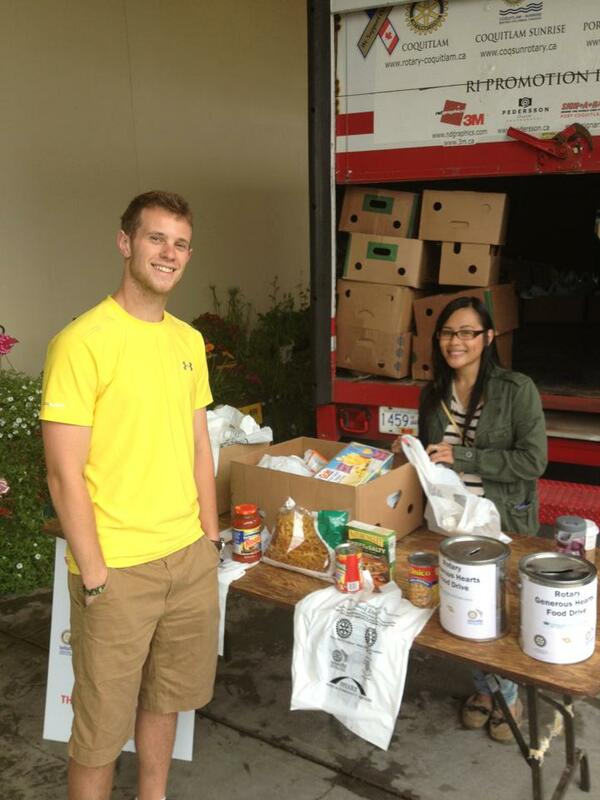 The event took place on Friday, July 12 and Saturday, July 13. Our volunteers (Jordyn, Alex, Janelle, John, Chantal and Jordan) helped with monitoring lanes and entering data. It was an inspiration to all of us to see how amazing some of these bowlers were and an affirmation of never making assumptions about another person’s abilities. We don’t think we could ever come close to bowling half as good as some of these guys! Thank you to the organizers and event managers of the Special Olympics, as well as all of the athletes and their families, for allowing us to be part of their weekend. 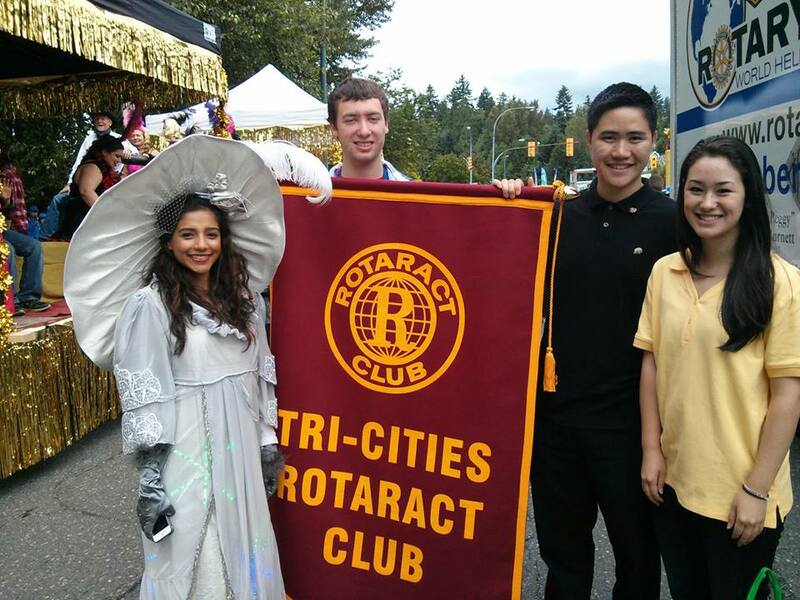 Rasmeet, Chris, Eric and Kimberley representing our club in the parade. We were extremely honoured to have the opportunity to participate with dozens of other well-known organizations from the Tri-Cities in the Port Moody Centennial Parade on June 22, 2013. Over 100 years of Port Moody’s past, present, and future were represented in the event, which ran from the Port Moody Civic Centre down Murray Street to Rocky Point Park. View the photos from the parade on our Facebook page. 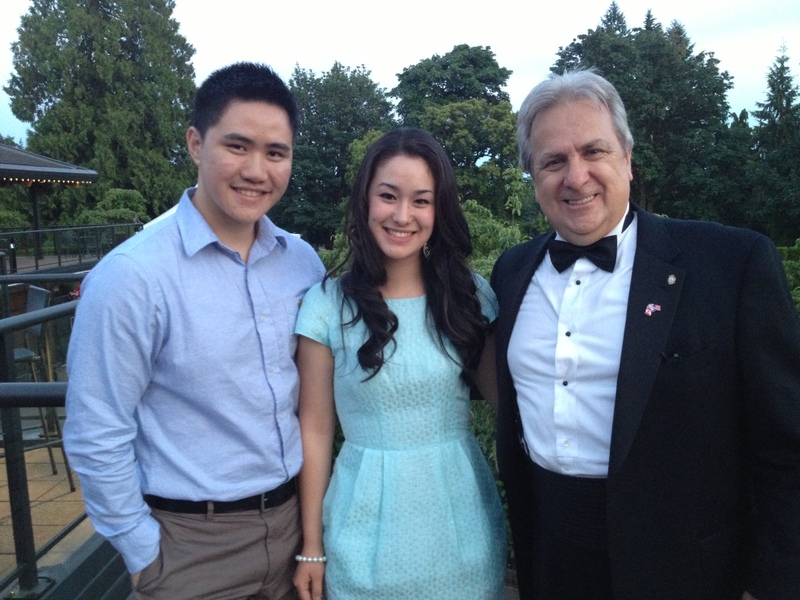 Our Vice President, Eric, and President, Kimberley, with outgoing Port Moody president Al Stjernegaard. The past few weeks have been busy ones for the Rotary Clubs in the Tri-Cities area, with all four clubs hosting their Installation nights for their incoming Presidents. First up on July 4, our official sponsor club, the Rotary Club of Port Moody, bid farewell to outgoing president Al Stjernegaard. 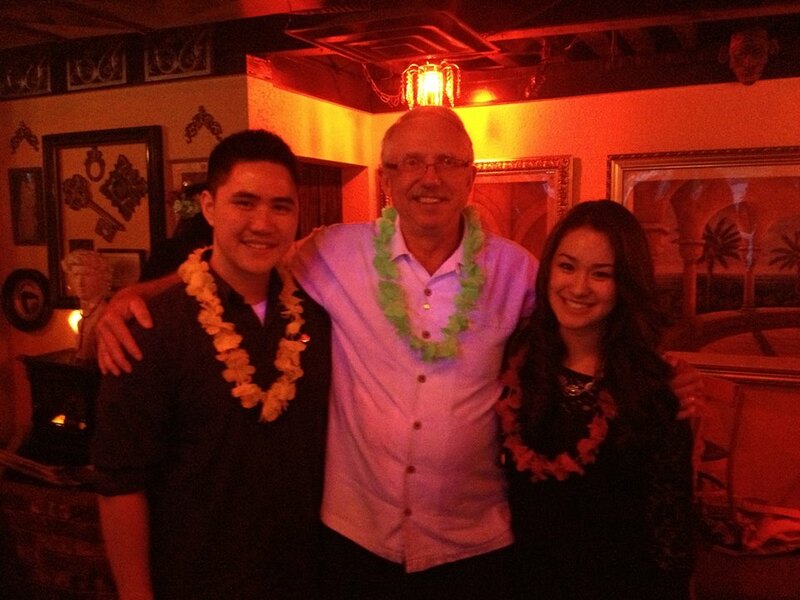 Al has played a tremendous part in the creation of the Tri-Cities Rotaract. His support and guidance over the past few months is very much appreciated, and we now have a group of over 30 vibrant, enthusiastic members. We cannot thank him enough for all the hard work he has done for us, but we wish him all the best and look forward to working with the new president of the Port Moody Rotary Club, Jon Dominy! 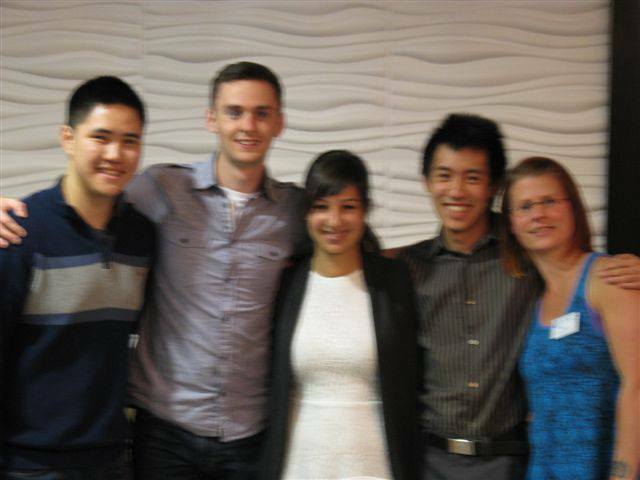 Eric, John, Camilla and Jordan with Port Coquitlam Centennial Rotarian Karly Simms. We would also like to congratulate Jim Fitzpatrick, incoming President of the Rotary Club of Coquitlam Sunrise, Harry Tubbs, incoming President of the Rotary Club of Coquitlam, and Angela Anderson, incoming President of the Rotary Club of Port Coquitlam Centennial, on their Installations! A special thank you to the Port Coquitlam Centennial club, who graciously donated a $300 cheque to the Tri-Cities Rotaract Club during their ceremony. 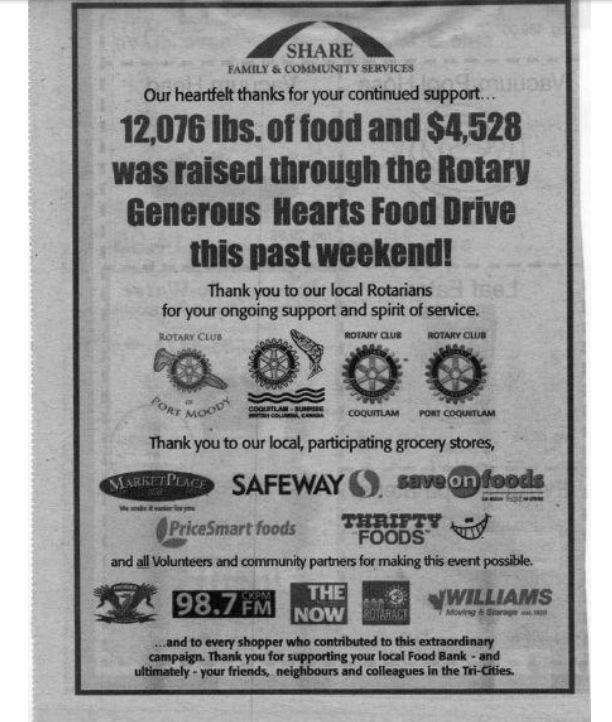 It is wonderful to know that we have the support of not just one, but four Rotary clubs in the area! 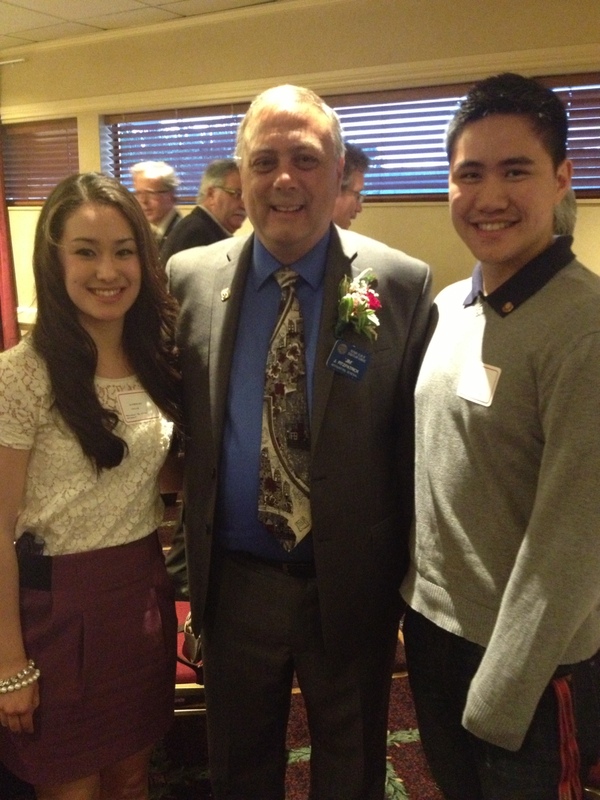 Kimberley and Eric with incoming Coquitlam Sunrise President Jim Fitzpatrick. 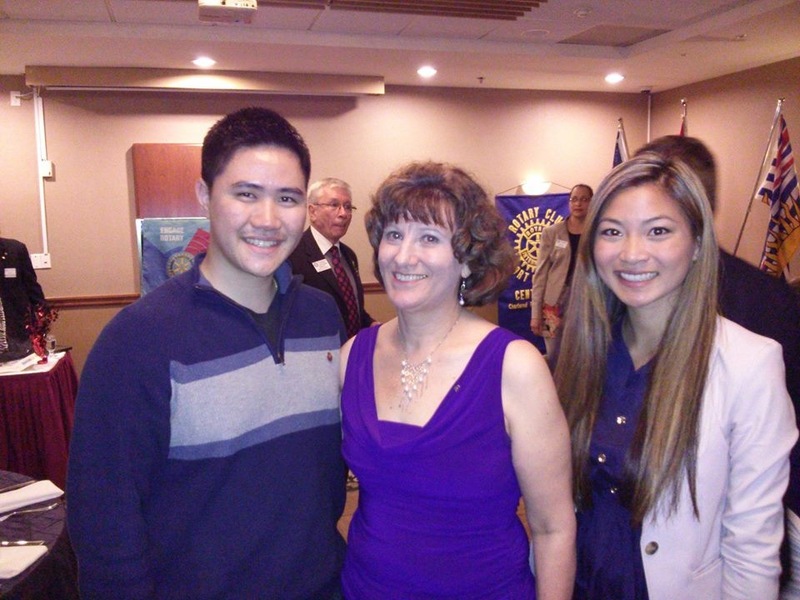 Eric and Eli with incoming Port Coquitlam Centennial President, Angela Anderson. Incoming Rotary Club of Coquitlam President, Harry Tubbs. 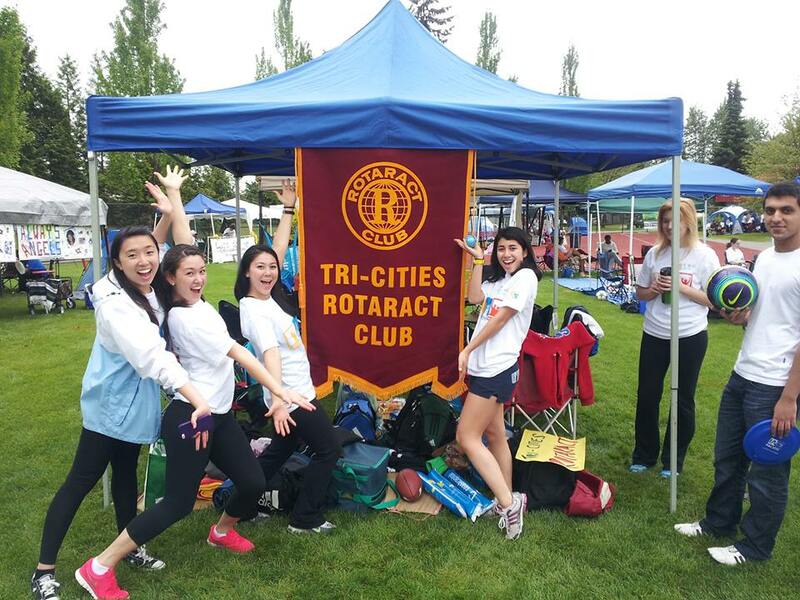 On June 1st we participated in the annual Relay for Life at Percy Perry Stadium in Coquitlam. The event, which ran all day from 10am to 10pm, consisted of a full day of walking, running, dancing, and game playing! Our group raised a total of $530, and contributed to the $428,814.39 raised in total by residents of Coquitlam for the Canadian Cancer Society. 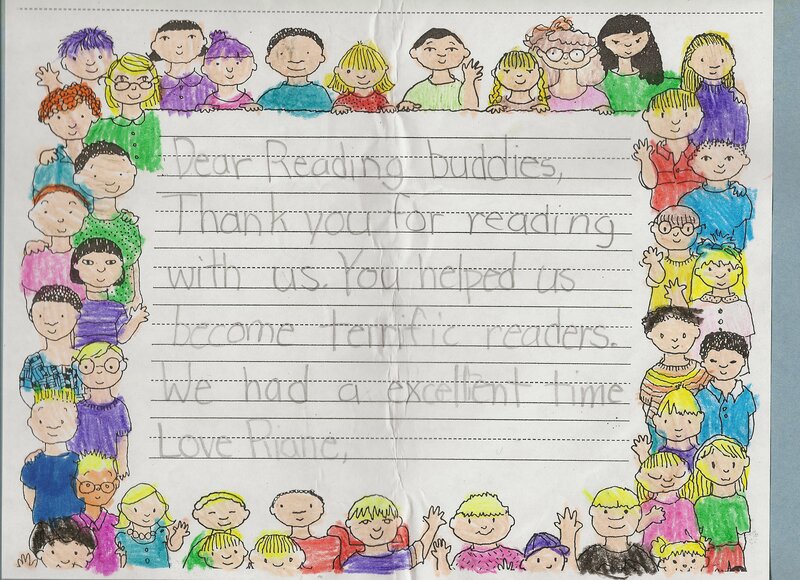 We look forward to participating again next year!